Do You Need A Pond Heater? Last winter was…just a *little* cold and snowy. I’ve tried to forget having to wear three layers of clothes on top of Under Armor, then walk outside and be up to my knees in snow. For some reason it keeps coming year after year, after I’ve had long talks with mother nature asking her to please turn winter a bit warmer with a lot less snow. She doesn’t listen. Last winter was obviously bad for most people, and animals too. For those of you that have fish in your pond, you may have lost fish due to the conditions last winter. If you didn’t lose any fish consider yourself very lucky, some clients lost thousands of dollars worth of fish. Many people become attached to these fish as they would a dog or cat, each fish having a unique personality with individual traits and characteristics. A pond heater or de-icer could have helped save some of these fish. Does everyone need a pond heater? Not necessarily, but if you live in an area were your pond freezes over every winter, it is highly recommended. 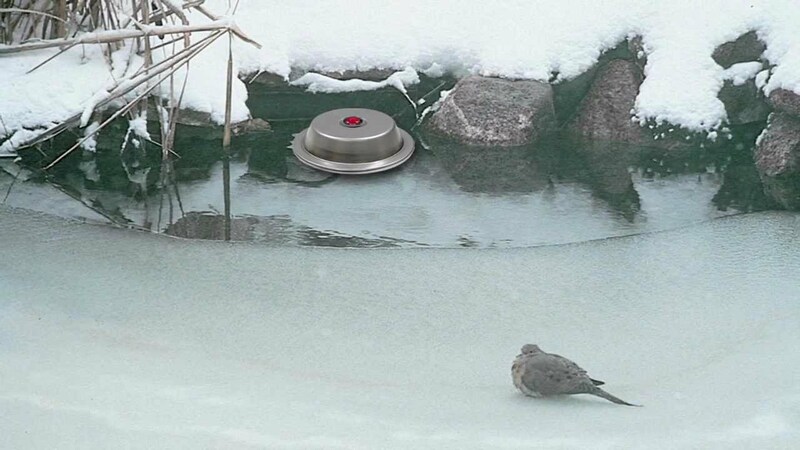 The pond heater/de-icer does not actually heat the pond water, what it does is; the unit heats up heating the area directly around it, which creates a hole in the ice, allowing harmful gases to escape that would otherwise be trapped with the fish in the pond. The hole will be maintained by keeping the heater/de-icer on. Added bonus; animals will stop by for a much needed drink, since water can be difficult to find in the winter. Can I use an aerator too? Yes! Using an aerator and heater/de-icer is a great combination and our preferred system. This will not only melt the ice and allow the harmful gases to escape, but it also adds oxygen and gets the water circulating. I’ve heard they are really expensive to run, is that true? Some of them can be, but we use a more energy efficient heater/de-icer which is 300 watts compared with other units at 1500 watts. Lets assume on average 1 kWh costs $.13 and you run the heater/de-icer 24 hours/day at 300 watts. The daily rate will cost $.936, and monthly will run $28.08. If you have different rates for your electricity, try this calculator to figure your costs. 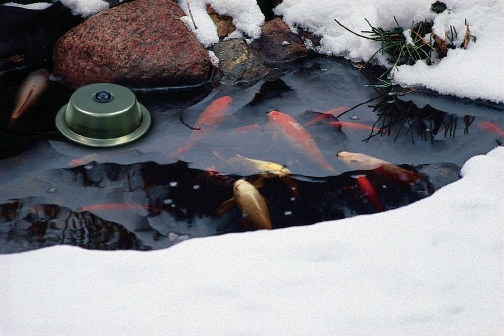 Considering your fish probably costs considerably more than $30, a heater/de-icer can be a good investment in your pond. Now you have some basic information on the pond heater/de-icer (which is the same thing by the way, just like soda and pop! ), if you have any further questions or would like to get on the schedule to winterize your pond, contact us today!